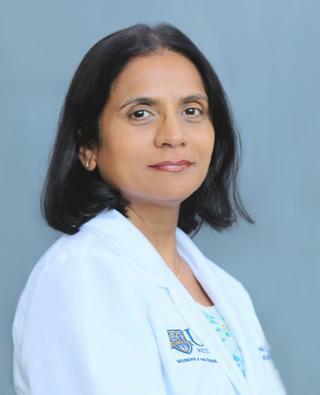 Dr. Sonal Munsiff is board-certified in Infectious Diseases. She manages many acute and chronic infections mostly in the outpatient clinic setting, with particular interest in bone and joint infections, orthopedic hardware, and cardiac device related infections, infections with drug resistant organism, HIV, and mycobacterial infections. She is working with a multidisciplinary staff to manage Outpatient IV antibiotics patients for the institution. Dr. Sonal Munsiff is board-certified in Infectious Diseases. She manages many acute and chronic infections mostly in the outpatient clinic setting, with particular interest in bone and joint infections, orthopedic hardware, and device related infections, infections with drug resistant organism, HIV and AIDS, and mycobacterial infections. She is working with a multidisciplinary staff to manage Outpatient IV antibiotic patients for the institution. She will be teaching "Epidemiology of Infectious Disease" Course in the Epidemiology Division of the School of Medicine and Dentistry in Fall 2017. Previously she has worked in the field of TB control for 15 years with the NYC Bureau of Tuberculosis Control, and with CDC. She served as the Director of Epidemiology for the Program for several years, and then was Director and Assistant Commissioner of the program for 7 years. She has conducted research on various aspects of TB, particularly drug-resistant TB, complications and treatment of TB in HIV-infected persons, transmission and molecular epidemiology of TB, outbreak investigations, and program evaluation. She was co-investigator for the CDC TB clinical rails Unit on studying Moxifloxacin for TB treatment. She has authored over 60 medical publications, including the NYC "TB manual". Dr. Munsiff's current research interests include optimal diagnosis and management of osteomyelitis, usefulness of the Interferon gamma release assays for diagnosis of latent TB infection, and diagnosis and management of non tuberculous mycobacterial diseases. Previously she has worked in the field of TB control for 15 years and has conducted research on various aspects of TB, particularly drug-resistant TB, complications and treatment of TB in HIV-infected persons, transmission and molecular epidemiology of TB, outbreak investigations, and program evaluation. She was co-investigator for the CDC TB clinical rails Unit on studying Moxifloxacin for TB treatment. She has authored over 60 medical publications, including the NYC "TB manual". Vinnard C, King L, Munsiff S, Crossa A, Iwata K, Pasipanodya J, Proops D, Ahuja S. "Long-term Mortality of Patients With Tuberculous Meningitis in New York City: A Cohort Study." Clinical infectious diseases : an official publication of the Infectious Diseases Society of America.. 2017 Feb 15; 64(4):401-407. Perri BR, Proops D, Moonan PK, Munsiff SS, Kreiswirth BN, Goranson C, Ahuja SD. "Mycobacterium tuberculosis cluster with developing drug resistance, New York, New York, USA, 2003-2009." Emerging infectious diseases.. 2011 Mar 0; 17(3):372-378.